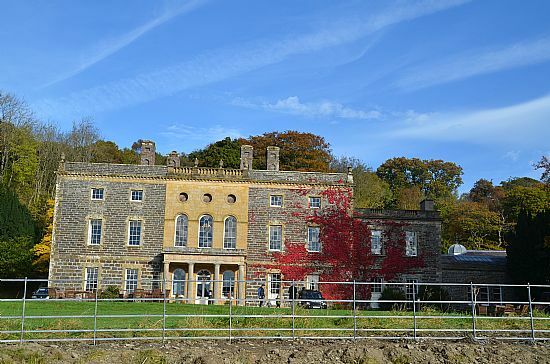 Nanteos Mansion sits proud in the Paith Valley, 3 miles north east from Aberystwyth, located in Mid Wales. The mansion was once the seat of the Powell family who ran the estate for over 275 years, covering over 31,000 acres at its peak in the 1830s. Life at Nanteos could be quite idyllic, long summer days, lazing in the sunshine. The summer visitors of family and friends came to stay in the big country house, to spend their time of leisure. 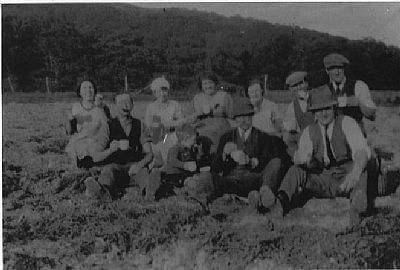 Not forgetting that summer is also a time of hard work for the estate workers with haymaking and many other important farming duties to keep up with on the estate. The following is a glimpse of hard work on the estate and the also the fun times during the summer months at Nanteos. 1854 Nanteos Print, ladies with their parsols taking in the views. The mansion sits majestic in its surrounds of the Park land which is landscaped to suit the gentry with their pleasure pursuits. Clumps of Beech trees are scattered about the parkland planted in early 1800s, by today the trees look very stately in their landscape. The grounds of Nanteos are well equipped for entertaining the gentry. The lake built in 1819 and had two boat houses; containing a boat each one elaborate with decorative metal on the sides, both boats ideal for boating and fishing. The front lawn had a 'Pitch and Putt' 9hole golf course. Also near the two majestic Beech trees near the house there was a fenced off tennis court; the net was held up by the patented 'AYRES' tennis posts which were manufactured in 1889 (money well spent, on top of the range lawn tennis merchandise). There was also a fine Victorian Summer House built onto a mechanism that could turn the summer house to be rotated towards the sun or away from it, whichever the inhabitant preferred. It was moved around the grounds to where it was needed (sadly it was demolished in the early 1980s). The luscious views of the parkland can be seen, from the mansion, which enticed the guest to explore and appreciate the landscape. The park land designed in the 18th century with additional 19th century designs. Ponies from the stables were available for leisurely rides around the park. There were also many bridle paths to roam around the woodland, which are still in use today. Behind the scenes away from the Nanteos visitors and guests was the busy work force. 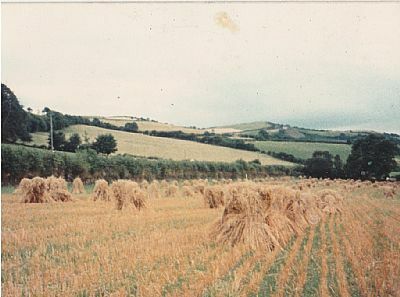 The estate workers working hard out in the field with hay making, potato picking, lambing and many other important duties of the farming calendar. As well as maintaining the land that was seen by the visitor in pristine condition. Many other jobs had to be done. At the lake not one lily was to be seen; two boats with a blade in between would regular cut them keeping the lake immaculate. The shrubbery manicured to the highest standard, the Nant Paith Stream that runs across the parkland and behind the lake would have cascading waterfalls featured along the stream and kept free from debris. 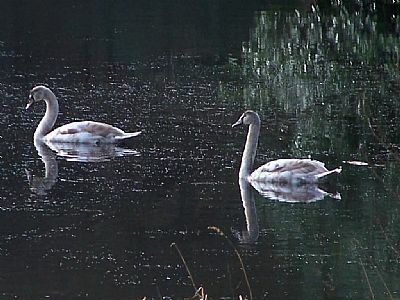 In 1822 at the newly completely lake an incident occurred that put everybody into a panic, the swans had escaped and were making their way down to the sea, Robert Oliver the Gamekeeper had to leap into action capture them to return them to the Nanteos lake. Finally they were caught and the Gamekeeper was paid £0.5.6d for his actions. While the busy work on the land was going on, the cook would be busy in the kitchen producing food, to feed the hungry workers. Baskets of homemade produce were taken out into the field, served to the workers from her large wicker baskets. 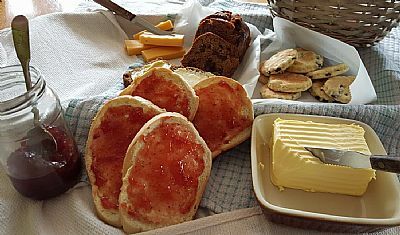 Bread, jam and cheese Welsh Cakes, apple or blackberry tart and tea. In later years when tea became cheaper and popular, Bara Brith was made. All produce were produced at the mansion, cheese and butter were made in the dairy, and bread was made in the bakery located within the Nanteos Court Yard on the east side of the mansion, with close access to the walled garden for fresh produce. Back in the day there were no tractors and machinery to ease the tasks. Horses were used to the full of their capabilities. Tasks like ploughing, muckspreading, pulling carts of hay just to name a few. The Thrashing machine first appears at Nanteos in the 1860s making life a bit easier for the estate worker. Sift the dry ingredients (flour and baking powder) together into a mixing bowl. Cut up the butter and rub into the flour. Stir in the sugar and fruit, pour in the egg and mix to form dough, use a little milk if the mixture is a little dry. Roll the dough out on a lightly floured surface to about the thickness of a biscuit. Use a pastry cutter to cut out rounds. Cook the cakes on a greased bake stone or griddle until golden. The heat should not be too high, as the cakes will cook on the outside too quickly, and not in the middle. Once cooked they are ready to serve. 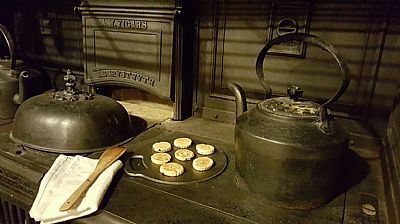 Welsh cakes made on a gridle on the Nanteos 'Vigars of Aberystwyth' cooking range. In a large bowl soak the fruit and sugar in strained tea and leave overnight. Next day preheat the oven to 170C. Line a 2lb loaf tin with baking parchment. Mix the remaining ingredients into the fruit mixture and beat well. Pour the mixture into the loaf tin and bake the oven and bake for 1½ hours or until a skewer inserted into the middle comes out clean. Various carts were used by the estate, notice in the photograph above a plaque on the cart. The Powell’s (and probably other estates) had their own personalised carts, saves any mix up in public places! The photograph above shows the plaque of E. A. L. Powell (Edward Athelstan Lewis Powell 1870 – 1930). Another example was William Beauclerc Powell’s cart plaque (W. B. Powell 1834 – 1911) with evidence of a faded G. E. J. Powell (George Ernest John Powell 1842 – 1882) faintly showing through. The hard workers were rewards with their efforts, with entertainment given by the Powells. The working community of the estate was a close one, and the participation of regular events, kept spirits high. Also every New Year a meal would be given to the workmen of the estate, as a thank you for the years’ hard work. NANTEOS. 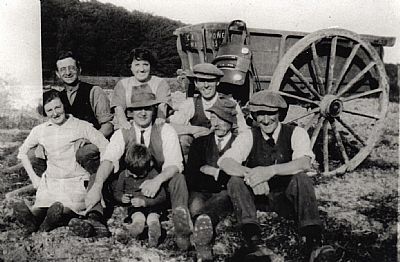 Generosity.—Mr and Mrs Powell, Nanteos, have this year renewed their kindness towards the workmen. Each was the recipient of over 4s. worth of meat, which was much appreciated. Mr .and Mrs Powell are well known for their liberality, both to the men and to the neighbourhood in general. All join in wishing them and their son, Mr W. E. Powell, health and prosperity throughout the year and for many years to come. Many people have a story or two of visiting Nanteos, fond memories of times gone by, that stick in the mind, whether just passing through or guests visiting. Local people would regular take a stroll through Nanteos, on a summer day. Cycling for the ladies became popular in late Victorian time, and as following exact from the ‘Aberystwyth Observer’ shows, Nanteos was a popular local route. ……... Lamps must be lit to-night at a quarter past eight. The other evening I went round Nant Eos for a run. I do not know whether Mr Powell is willing or unwilling that cyclists should use his drive, but presuming upon a general invitation, of many years' standing, to use the grounds and call at the house whenever I liked, I ventured. But the drive was covered with gravel; which cause a noise as of a hailstorm and my companion and I had to push our machines most of the way. On passing the lake I was reminded— although no reminder was necessary—of a pleasing little incident which occurred there during the severe frost of two or three years ago. After pushing our machines as far as Moriah we mounted and came down to Penparke in fine style. I had not previously seen the four new houses which Mr Powell, Nant Eos, has built on the site of the old Piccadilly and the adjoining cottages, which will greatly improve the appearance of the village.…………..
During the 1930's a family from Birmingham would rent Nanteos every August, for a whole month. The Burman Family came to know of Nanteos through an advertisement of a place to stay Wales (Margaret Powell went to stay with Capt. Briggs and his wife at Penwern, New Cross). The motor coach would trundle up the drive full of excited guests. They took over the entire house, bringing with them their own servants, to accommodate with all the family needs. The Nanteos servants and the Burman family servants had their own get together in the Servants Hall, with the occasional party and merriment throughout the August month. They got to know each other very well, over the years. The Burmans did not pay for their stay at Nanteos; instead, they repaired and improved the many things around the house that needed maintenance. The imperfections of the house at the time included faulty wiring and bath water that was brown in colour and apt to run cold very quickly. Some of the party who slept on the second floor of the mansion were alarmed when they were shown the fire escape; a thick piece of rope tied to the roof that would be accessed through the window in the event of an emergency! 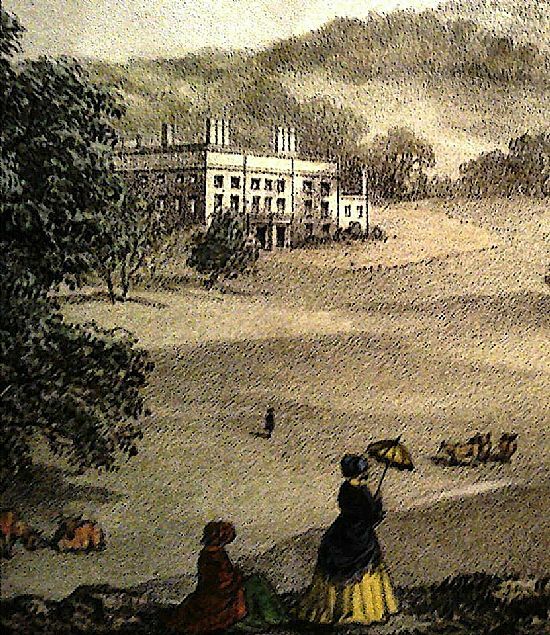 Despite these inconveniences, the Burmans spent a great deal of time enjoying the pleasures of stately home living: horse riding, playing on the tennis court under the beech trees on the front lawn, rowing on the lake and golfing. One year Sir John Bedford Burman, came to Nanteos in his Rolls Royce to stay with his family, he was Conservative MP for the Duddeston division of Birmingham. He was first elected to Birmingham Council in 1934 and sat for 32 years. With the jollification of the annual visit on the Burman Family and their entourage of servants to Nanteos, below stairs - love blossomed. Lilian one of the maids of the visiting family fell in love with the Nanteos carpenter Vernie Rowantree. 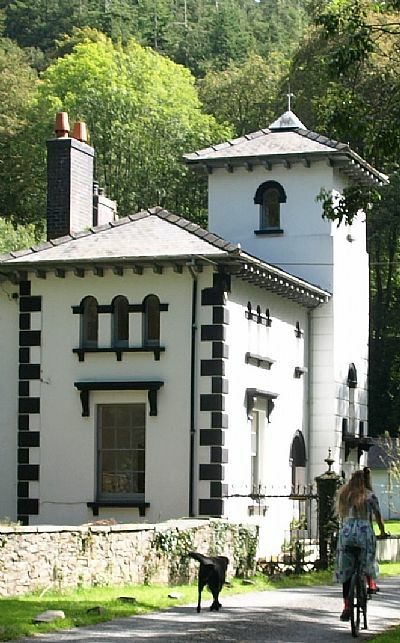 Vernon Rowantree and Lilian Emma Garratt were married, in the Baddesley Ensor in Warwick in April 1935 and lived at Nanteos, then later moved to 2 Piccadilly Terrace Penparcau, Aberystwyth. The Burmans’ annual visits ended at the outbreak of the Second World War. Living on a big estate, there was an abundance of pets at Nanteos, horses & pony, donkeys, cats and dogs, and other types of pets including birds and, a pet otter called Jacob. It is ironic that Nanteos, a home of hunting and shooting that they would even consider buying an otter, for a pet. The otter came from Bristol Zoo in 1871. Delivered by train, the tame otter would have run of the estate, luckily everyone knew he was a pet, so he would not have survived the day! When he died, Jacob was stuffed and put on display in the house. During the 1930s and 40s Stuart, a white Moluccan cockatoo, terrorized the staff of Nanteos, especially if they were wearing Wellington boots! Originally he lived in The Nanteos Home Farm (The Buildings), and originally came from India with Stuart Jenkins when he returned from serving the war. Eventually he came to Nanteos and lived in and around the courtyard. Stuart would lie in wait for passers-by and then pounce on his victim. His favourite food was scrambled egg and he flew into a rage when given porridge. He is buried in an unmarked grave in the pets’ graveyard. 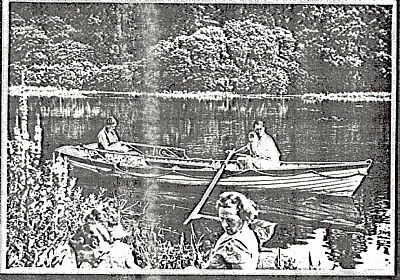 Local children from the surrounding area would find Nanteos a place of adventure, playing in the woods, climbing trees, jumping into the row boats and rowing about in the lake, hoping not to get caught. The boats were kept in two boat house, location at the west side of the lake, now sadly quite dilapidated. During the 1930s a replica model of a winning yacht of America’s Cup was kept at Nanteos and on special occasions would be taken down to the lake and played with. Children would visit the two Horse Chestnuts trees, on the front lawn of Nanteos to pick the biggest, shiniest conkers. Taking them home to get them threaded them, then with their friends taking it in turns striking each other conker until one breaks. 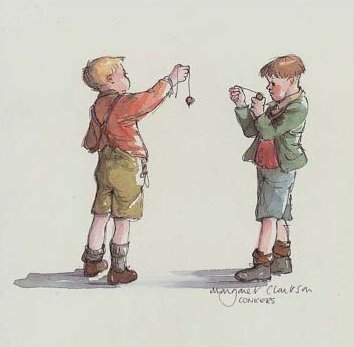 Conkers competitions were played in school during playtime. Sadly by today the conker is not in such demand and the beginning of the twenty first century playing conkers were banned from the school yards, due to health and safety reasons! Some local children, who dared venture close to the house, were invited in tea with Mrs Powell, were they would have their fill and play games in the big house. Margaret Powell having lost her only child in the First World War enjoyed children’s company, and filling the house with laughter and fun. Will be held (by kind permission of W. B.
Pier Street on paying the cost of this advertisement. 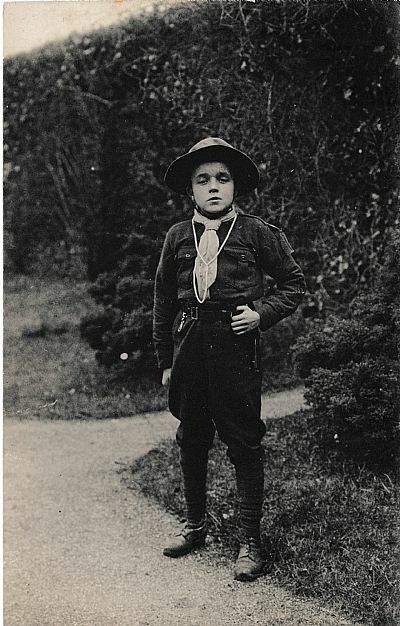 The Boys Scout Association was formed in 1908 by Richard Baden Powell, a Lieutenant General in the British Army (not related to the Powells of Nanteos) and the association spread throughout Great Britain. Permission was granted for the parkland of Nanteos to be used for their annual campsite. 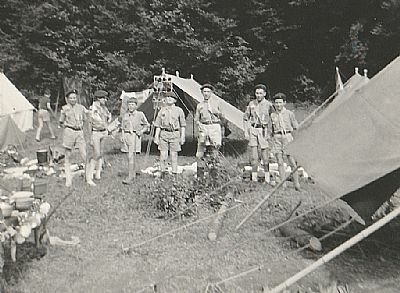 The Boys Scout Association held their annual camp at Nanteos for a number of years. They came in their droves, as one group left another would arrive. They would travel to Nanteos from all over the world. A bus would drop them off at the back drive at Moriah on the Devil’s Bridge road and they would make their way down the back drive to Hendryd field, where they would set up camp. 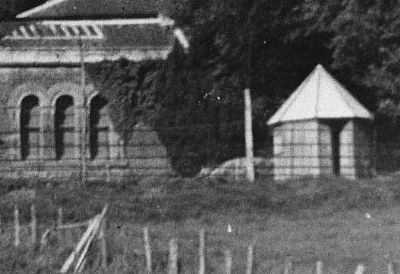 The water supply came from Nanteos Home Farm 'The Buildings' and they would regularly call at the farm with their churns to fill with water. Sometime Mr Scott of ‘The Buildings’ would take some water down to them on his tractor. Great enjoyment would be had by the boys in the Nanteos fields, tree climbing and building dens. NanTo keep the milk cold they would make a dam in the river Paith to keep the bottles of milk cool. Close to the river they constructed a manmade shower by filling up a 45 gallon drum with drilled holes at the base. They also built a hide from sticks and branches to watch the badgers come out at twilight. The scouts had no end of activities. At the end of their stay and in return of thanks the boy scouts would invite The Building’s household to their jamboree where everybody would sing and play games around the camp fire, until the early hours of the morning. Nanteos lays in the minds of many people throughout the ages, bringing many happy fond memories; this is just a few examples of Long Happy Summer Days at Nanteos.